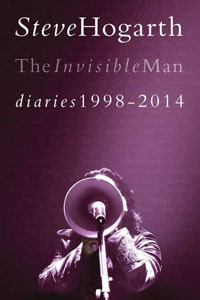 Share the post "Book review: STEVE HOGARTH – The Invisible Man – Diaries 1998-2014 (Volume 2)"
Part two of Steve Hogarth’s diaries takes up the story in 1998 and finds our Marillion man once again juggling domestics and business. Steve’s son Niall (now his sound tech) was only just born at the start of the diaries in 1991. By 2012 he is celebrating his 21st birthday. There was no Skype, FaceTime or mobile phones to keep in touch with loved ones back in the early-1990s and there is no doubt this separation whilst on tour caused problems. From 1998 we jump to 1999 and it is not clear why Steve has arrived in Padstow, Cornwall other than for an unannounced break but there is a slightly strange – if somewhat romantic – vision created of our swashbuckling hero sleeping overnight in a jeep and then looking for CDs in a local record shop. The first volume started in 1991 some time after Steve Hogarth had joined Marillion and was rather light on the detail of his “apprenticeship” but in 1999 at a gig in Switzerland it seems that at least both he and Fish have bonded. But 10 years later some fans he encounters still think Fish is in the band or that they split in 1988. Fans should really view these diaries as a travelogue with a musical and Marillion interest. And as previously Steve didn’t write a diary every day, so for example the narrative can be a bit jumpy. We are not really told how Hogarth came to meet one of his heroes, the astronaut Neil Armstrong, in June 2000. Fans will enjoy the tales of certain gigs and tours. The band’s strange coupling with Deep Purple in 2010 is covered in some detail along with their South American jaunt in October 2012. When we get to April 2014 – and Marillion’s appearance on the ‘Cruise To The Edge’ (a sad sign of the times and, based on this account, perhaps more appropriately ‘Booze To The Edge’) – the name-checking of various prog celebs actually gets a little tiresome and we are left thinking that Hogarth’s text is all the better for the lack of excessive celebrity intrusion. By the mid-1990s Marillion had lost their contract with EMI, but strangely there is nothing here about the politics, economics, or the beginnings of the band’s trailblazing self-funding. This was revolutionary back in 2001 when they first financed an album – Anoraknophobia – and the band have now accumulated a 45,000-plus database. It obviously works to Hogarth’s advantage when the band advances a £100k loan in 2009 so that he can make an offer on his next house. This is especially significant as in late-2011 he is still trying to sell his former property. Although not in the book, Steve is evidently quite bitter about the TV documentary on the raising of Donald Campbell’s ‘Bluebird’ which omitted to mention that a Marillion song ‘Out Of This World’ inspired the venture. The section of the book when he and Steve Rothery went to Coniston in March 2011 to witness the removal of the craft, and where he later sang at Campbell’s funeral, is both poignant and fascinating even if slightly surreal at the time. In 2004 there is high jinx when the band travel to Mexico City via Washington DC and where the normally mild-mannered Steve gets a little aerated over air alcohol restrictions. And by the end of 2005 Steve’s personal life is up-ended when he separates from his wife, but – invited to Norway by a friend – he soon falls in love with Linette. This entry was posted in All Posts, BOOK REVIEWS, INTERVIEWS, Interviews/Rock Stars and tagged book, Diaries 1998-2014, interview, Marillion, progressive, review, rock, Steve Hogarth, The Invisible Man. Bookmark the permalink.